What are moment arms and how do they work around joints? A moment arm is simply the length between a joint axis and the line of force acting on that joint. What are force vectors and how do they apply to exercise? A force vector is the direction of a force. On the page covering the essentials of movement mechanics we talked about the line of force of gravity. There are many force vectors at play when we lift an object. We have gravity, the force of friction on the object, ground reaction forces, muscle forces (generated in the line existing between the origin and insertion of the muscle) and forces of momentum and so on. The outcome of a movement is the sum of all vectors and their respective forces. 1. In this squat you can see the moment arms around the hip and knee – they measure from the joint axis to the line of force. In this bar position the moment arm around the hip is slightly longer than that around the knee. This means the hip extensors (gluteal muscles) will be doing slightly more work than the knee extensors (quadriceps) in terms of the force they’ll need to generate to overcome the load. 3. The trunk, knee and hip stabilisers will be worked significantly, especially as more load is added. 4. This squat will most likely be lost from the core, resulting in the lumbar spine rounding and the bar dropping forward, so cueing of 'chest up', 'tummy tight', 'push through the hips and up' will help. As with all squats knee alignment, if lost, can cause counter rotation in the lumbar so cueing knee position as your clients fatigues is also important. 1. In this squat you can see the moment arms have changed slightly. 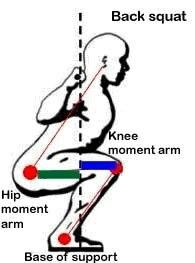 They are now about equal meaning the loads around the hip and knee will be similar. This means the hip extensors and knee extensors will need to generate similar amounts of force throughout the movement. 2. This posture is also good and should be encouraged. 3. The shoulder, trunk, hip and knee stabilisers will be worked significantly, as in the back squat. 4. This squat will also be lost from the core or from the shoulder girdle due to the positioning of the bar, so cueing of 'elbows up', 'chest out' and 'tummy tight' will help. 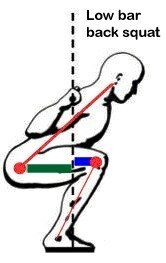 As with all squats knee alignment, if lost, can cause counter rotation in the lumbar so cueing knee position during fatigue is again also important. 1. In this squat you can see the moment arm around the hip is at least twice as long as the moment arm around the knee. This low bar position is the position power lifters tend to use as it involves the hip extensors a lot more than the knee extensors and the hip extensors are able to produce more force than the knee extensors and act around a joint with better articulation (deep ball and socket versus the knee which is a shallow joint). As the hip extensors are able to produce more force than the knee extensors then this squat variation enables heavier loads to be lifted. 2. The posture wouldn’t be encouraged except where needed for performance in competition (e.g. 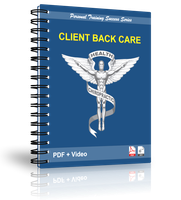 powerlifting or other sports where this position is required under load) as huge loads are placed on the lumbar spine as well as the hips, and these areas need to be progressively conditioned to withstand these forces. This is an 'advanced' lifters posture. 3. 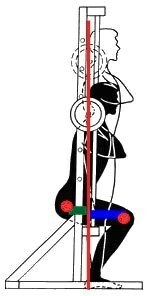 The hip and trunk stabilisers will be worked significantly with this variation. 4. This squat will be lost from the core, resulting in lumbar rounding so cueing 'tummy tight', 'drive up and through', 'head still' will help. As with all squats knee alignment must be maintained. Finally to understand force vectors a little more let’s take a look at the smith machine squat with feet slightly out in front and then the swiss ball squat which are commonly prescribed squat variations in fitness clubs. 1. You can see here the moment arm around the knees is substantially longer than that around the hip. This, over time, will encourage the quadriceps to become stronger and the gluteals to develop only a little. Unfortunately it will teach the person to squat with their thighs and not use their gluteals in a normal way. It will eventually bias the movement pattern and over time could cause knee injury or low back problems. You can also see the line of force is on the heels and not the mid-foot. This is not a natural position. 2. Although the torso is in good posture here, you usually see a flat back in the clubs. As the gluteals are not very active the core isn’t always active. Also, the bar is stopping the person moving forward as they can hang on to it, so there is little requirement for the trunk extensors to be active. This posture and it’s mechanics should not be encouraged. 3. Very few stabilisers will be used as the exercise has eliminated most natural sagittal plane requirements due to the fixed bar and virtually all front and transverse plane requirements. 4. If a person were to fail on this exercise it would be around the lumbar for stability. 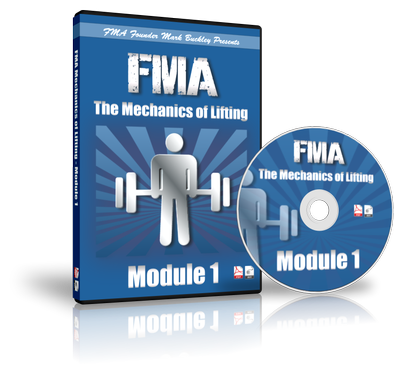 The most likely failure will be a very poor spinal position as you can keep lifting longer into muscular fatigue when you don’t have to stabilise your position. Interestingly when we ask why this squat is prescribed we often get told it is to help someone build up to free weight squatting because they can’t yet squat, or it’s to strengthen the gluteals and teach them the movement. None of this seems reasonable when you understand the biomechanics. 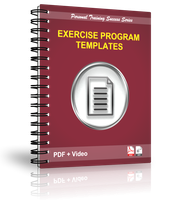 The best way to help clients build up to free weight squatting is through teaching bodyweight squats with a range of movement that suits each individual client. One final point. 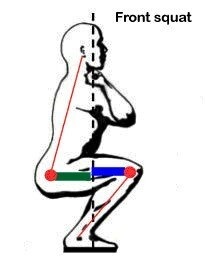 When you do this squat the further you put your feet out the more the knee extensors (quadriceps) become active and the less the hip extensors (gluteals) do. As this occurs a force vector that creates knee shearing develops and increases such that if used over time the knee joint is almost guaranteed to get injured. You’ll see this in a more pronounced fashion in the swiss ball squat. 1. The line of force is marked going down through the centre of mass in blue. The base of support is a long way from the line of force and the centre of mass will be around the very top of the thighs. The knee moment arm is in green – basically this exercise is all quadriceps, and very little gluteals (if any) given there is virtually no moment arm for them to act around. 2. The yellow line represents the force vector of the quadriceps – we know a muscle shortens from it’s origin to it’s attachment. Because of the moment arm of the quadriceps and because the person must constantly push backward to keep the ball on the wall, there is constant shearing force at the knee joint. In order to cope with the quadriceps activity the inner unit of the knee will be constantly challenged (the inner unit includes the cruciate ligaments, lateral and collateral ligaments, and hamstrings). The torso is dormant as it is resting on the ball (if anything only the erector spinae may be active to hold the torso on the ball), and the gluteals are dormant as they have no way of contributing to the exercise. None of the learning the brain is doing in this exercise is of any use, nor is it safe over the long term. So this is not a posture that we would ever encourage. 3. 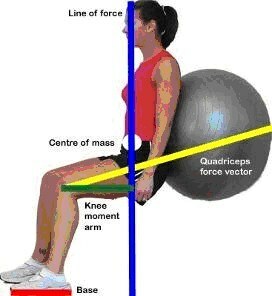 Although on a ball the transverse and frontal plane stability required is less than in a free standing squat. Sagittal plane stability is created through friction with the ball. 4. Failure in this exercise would likely be muscular and around the knee or hip. At the knee there maybe significant discomfort causing the client to stop. At the hip the client may lose alignment (medially rotate the femur) resulting in the knees turning in. Again this exercise is often prescribed as a regression from free body squatting. It seems, given the biomechanics, it is not. Finally, given we like to ‘progress’ our clients by loading them, you can often see this exercise being completed with dumbbells in hand increasing the load acting through the line of force. It could be suggested that getting a baseball bat and smashing your client in the knee caps would be a more effective and upfront way of doing the damage people seem intent on causing with this exercise. So to cut a long story short - please think twice about exposing your clients to swiss ball or smith machine squatting, and then choose a safer, more effective version!